If you run your own small business, then the chances are high that you work many hours a week, whether from home or at the office. Do you ever find yourself working long hours, but not having much to show for it? 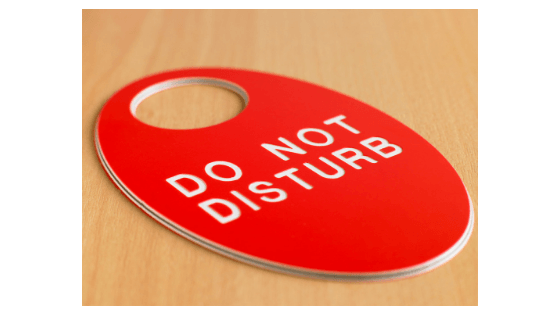 Flitting between tasks, trying to get everything done, focusing on marketing, profits, staff training, as well as all the day-to-day minutiae which need to be attended to, can easily while away the whole day before you know it. If you think you may not be as productive as you could be, take a look at your general working practises and be prepared to make some changes. It’s remarkably easy to slip into bad habits, even ones we’re already aware of and trying to avoid. 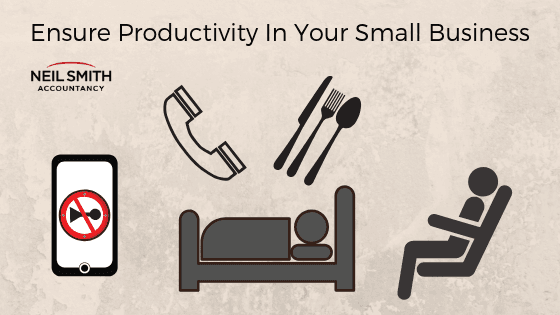 As long as efforts are made every once in a while to take an honest look at the way you work, you should be able to avoid the productivity killing habits we cover below. It may seem odd to kick off with a point about food when discussing productivity at work, however as the old saying goes “you are what you eat”; eating habits can have a huge impact on your performance. It’s important to ensure you eat healthily at regular intervals, and where possible avoid quick fix foods which give you a boost of fat and sugar but leave you feeling deflated in the long run. This will not only help your overall energy levels and cognitive functions, but a good balanced diet should help your immune system to better protect you, decreasing the amount of sick time you have to take. Another one it might seem strange to see on this list, as technological advances have enabled workplaces to be far more productive as the years have gone by. However, the temptation to look at your tablet or phone, notifications from your computer, even unimportant emails can interrupt your thought processes and make tasks take much longer than they should without distractions pulling your focus. Turning off notifications from your various devices, snoozing your mailbox for a period, and closing down all windows and tabs unnecessary for the job at hand can help you to steam through work without your mind wandering. Believe it or not, sitting down has been linked to many health problems such as body pains, stress, weight gain, depression and heart disease. Standing desks have been shown to improve productivity by up to 10% and can be a great idea for your business; they don’t mean saying goodbye to sitting, as desks can be adjusted so working either while standing or seated is still possible. When you’re under a close deadline or you’re feeling under pressure due to your workload, it is common to attempt to keep working for long periods with no break until the job is complete. This can be a big mistake. Your brain will work more slowly the longer you go without a break, as you get increasingly tired errors will be harder to spot and mistakes more difficult to put right. In addition, often the solution to a problem will come to you only once you have stopped giving it conscious thought. No matter how fantastic you are at running your business, everyone needs a little help and support. Letting go of some control and learning to delegate can really save you some time to get on with other tasks which are a better use of your time. Whether you use freelancers or take on regular employees, more hands will lighten the load; delegating simpler and less crucial tasks so you can focus on the big stuff, or outsourcing parts of the job you struggle with can allow a lot more work to be done. Some parts of running a business, for example managing the financial side of things, can be a real headache to worry about on your own. With the peace of mind provided knowing your company accounts are being looked after by a professional, your mind will be clearer to deal with the day to day running of your business. If you’re in Essex or London, Neil Smith Accountancy could be just what you need; get in touch to discuss how our expert business advice can help you. Whether you’re a night owl or an early bird, it’s important to ensure you get into a sleep pattern that is right for you. It’s not necessary to rise with the cockerel and go to bed with the sun, however it’s important to get six to eight hours’ sleep into your typical twenty-four hours in order to perform at your peak.